Belgium, possibly Ghent, ca. 1470-1475. Gift of an anonymous donor in honor of Don Emerson, 2011. Parent codex: a Book of Hours that was broken up by 1916. This leaf: Eugène Pelletier, France, 1916; Paris, Piasa, 21 January 2011, lot 27; bought by an American collector; given to the Morgan, 2011. Illustration: Christ Nailed to the Cross. Decoration: single large miniature with a foliate border. Artist: Vienna Master of Mary of Burgundy or a close follower, artist of the Frontispiece of the Holy Trinity Guild register (Luton Museum Service, 1984/127). Verso of leaf is blank. Four leaves (present whereabouts unknown) with miniatures of Christ's Passion, owned in 1916 by Paul Durrieu, are not, pace Durrieu's 1916 article, sisters. 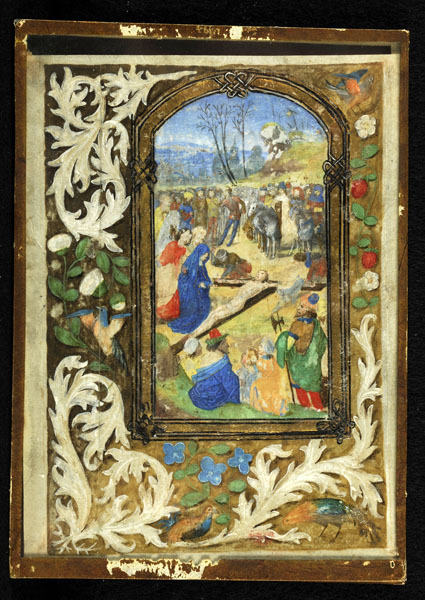 This "Christ Nailed to the Cross" is closely related to the innovative miniature of the same subject by the Master of Mary of Burgundy in the Hours of Mary of Burgundy in Vienna (Österreichische Nationalbibliothek, Cod. Vind. 1857, fol. 43v).